When R.E.B.E.L.S. cancellation was announced, I realized that there would be an open slot in my review schedule. And not knowing which title should slide into that slot, I thought a poll would be fun, opening up the decision to popular vote. 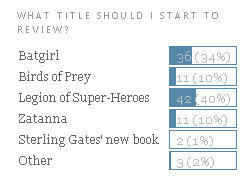 There had been a few suggestions prior to the poll so I included those titles as choices. 105 people took the time to cast a vote. Thanks to all who participated. It very quickly became a two title race between Batgirl and Legion of Super-Heroes, both titles that I collect and enjoy. I have to say I would love reviewing any of the books on the list but there had to be a winner. And, after Batgirl had opened up an early lead, Legion finally overtook her and maintained a slim lead until the poll closed. So from now on, Legion of Super-Heroes will be reviewed on Comic Box Commentary. It seems appropriate given that R.E.B.E.L.S. is sort of an LSH offshoot. And the Legion is one of my all-time favorite group of characters, so I come with some degree of historical knowledge. I'll start with the Legion of Super-Villains one-shot next month. I don't know how much cross-over there will be with Adventure Comics so hopefully I haven't got myself into a deep hole here. Again, I want to thank everyone who comes here and was interested enough to vote. I can't believe that over 100 people voted, by far the most votes in a poll of mine. Thanks so much for your time and interest! With the release of Action Comics #898, creative team writer Paul Cornell and artist Pete Woods continue to steamroll to the ending of this Lex Luthor arc. I wasn't planning on enjoying this arc as much as I have. I was ready to bemoan the fact that Superman is starring in the book. But good stories always have a way of soothing my irascible nature and this has been a very good story for any number of reasons. For one, I have enjoyed watching this slightly unhinged Luthor storm his way through the DCU in his quest for power. Usually Lex is calm and collected, allowing others to do his dirty work. But here, Lex occasionally seems off his game. I am not used to seeing that. At first I wondered if I might tire of the 'guest of the month' format of this book as Luthor runs into a different villain each chapter. But that interplay has also led to some great stories, showcasing Lex by contrasting him to the other villains he has run into. There has been the mystery behind who is manipulating all these events. Are there more than one big names prodding Luthor in this story? And finally, of course, after initially finding her distasteful, I have come to love LoisBot. She is going to be the most tragic character in this book, I promise. I think, like Pinocchio, she has decided to embrace 'real life', developing 'real feelings' for Lex, and I am sure she is going to suffer for it. Plus, she just oozes 1940s glamor like Rita Hayworth while still being able to wield massive weapon arms. That's not easy. The issue starts at a LexCorp rocket base with Luthor planning on heading into space to evaluate the 4 interplanetary black energy globes. It is revealed that those space globes are all conveniently moving together, making it one-stop shopping for Lex. My guess would be that the 'old Lex' would be suspicious of this, not viewing it as serendipity, but recognizing it for the potential trap it is. But this power-hungry Lex is goal-oriented. Nothing is going to stop him from completing this quest. I do like that we see the LexCorp staff still murmuring about the loss of Spalding. Such a death would rattle a workforce. I don't know if I would want to work somewhere where death seems so close. And, finally, we see that Lois is working for someone else, acknowledging that she has a master, a mission, to keep Lex moving towards the black energy globes. But even as I read her lines, you can see how she is conflicted. She talks about her mission, but the lines sound flat, as though she is sad that she is doing what she is doing. While there are 4 black energy globes in space, there is one remaining globe on Earth. And, as luck would have it, Larfleeze possesses it and brings it to Luthor. 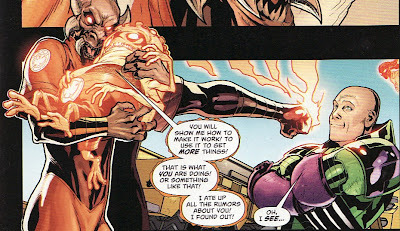 Okay, I don't know why Larfleeze would necessarily do this. Maybe it makes the story progression a little too easy. I was happy to see Luthor in the classic armor. I think we have seen him in this armor on the cover a couple of times during this run, so I was glad to see it actually within the story. And the hexagon force field is a nice effect. 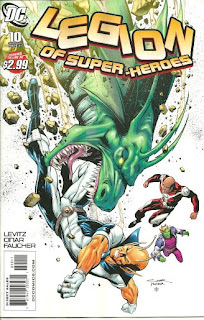 It turns out that Larfleeze cannot get the black energy globe to do much of anything and he is hoping that Luthor can help him get access to the power within. In what I think is a nice artistic flourish, Glomulus has swallowed the globe. He looks like he has a belly ache! I also like Luthor's smug and almost dismissive expression as Larfleeze threatens him. This is the Luthor I like, unbelievable confident and in control. I'll say it again, Pete Woods art on this arc has been absolutely phenomenal. 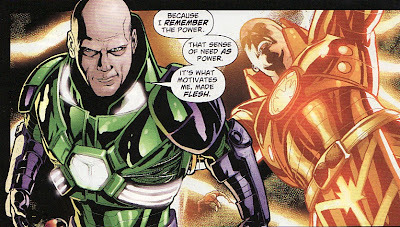 But just as cool and collected that Lex is, we get another taste of the more out of control Luthor. It is odd to hear Lex say something about his flesh being motivated. It just seems a bit off. Even if he thinks such things, that seems like something he would keep to himself. I really hope that there is more to this than just his taste of power. I keep hoping that he is being mentally manipulated as well. 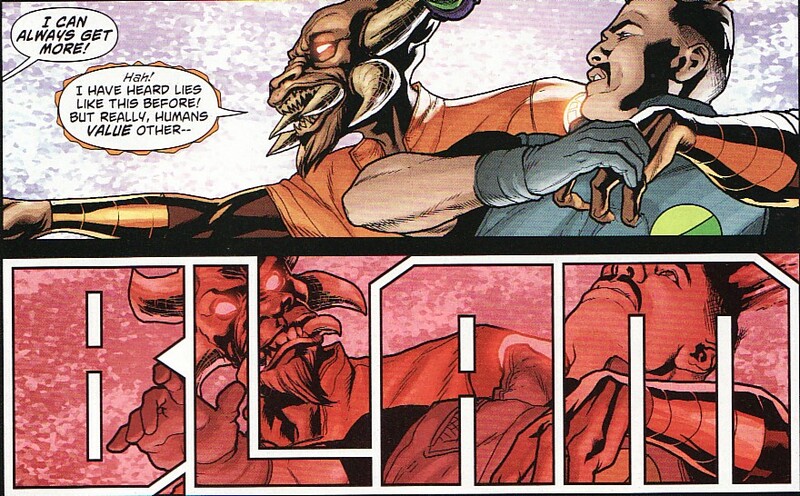 When Luthor refuses to help him, Larfleeze takes a hostage to try to force Lex to comply. In what again seems to be an atypical action, Luthor shows that he can't be blackmailed or bargained with. He shows that hostages and his workers are meaningless. And he delivers that message with an exclamation point, killing the hostage in front of countless witnesses. It just seems like Luthor wouldn't do something like this in front of so many eyes. His power plays are usually through underlings or in the shadows. So again, I hope that something is making Lex act against his normal grain. 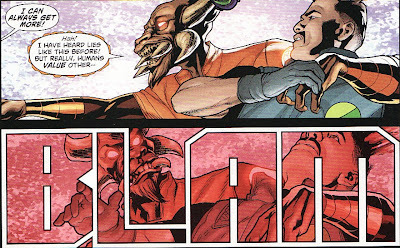 But it is clear that Lex wants Larfleeze's black energy globe and he figures out a slick way to get a hold of it. 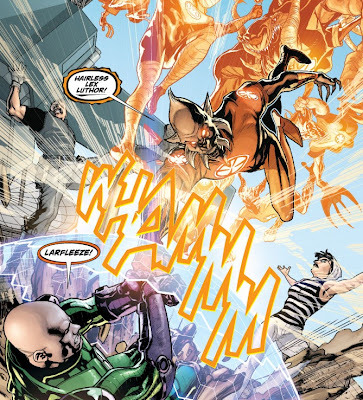 He physically grabs Larfleeze and tosses him into the Joker's changed energy globe. Much like it did witht the Joker, the globe acts like a portal, sending Larfleeze away. And with him gone, the globe is captured, analyzed and changed. Suddenly Luthor is closer to his goal. Only the 4 globes in space are left for Lex to analyze. And then his quest for power will be complete. Lois begs him to change the energy globes via remote from Earth, but Luthor wants to be there. He climbs in the rocket to complete his quest. That also seems like an unnecessary risk, something Lex wouldn't do. 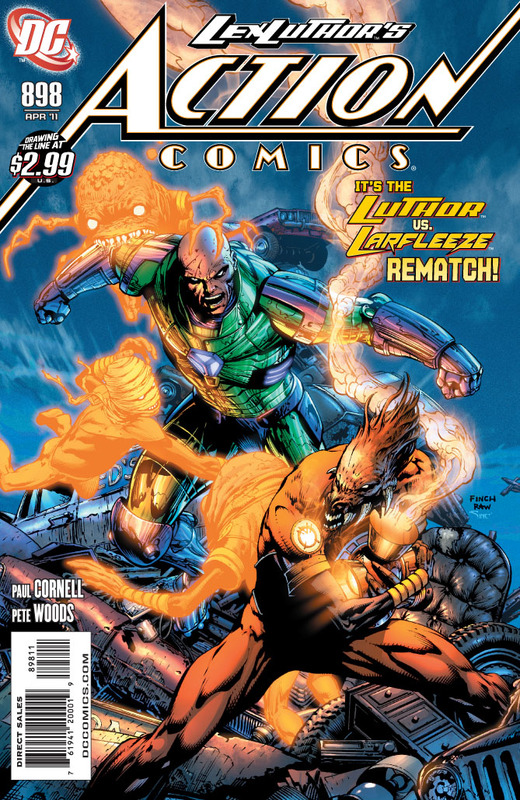 My favorite moment of the book is when Larfleeze exits out of the energy globe in the Arctic, the first one Luthor changed. Whatever horror the Joker saw in there, Larfleeze sees it too. And he doesn't want that to come about. 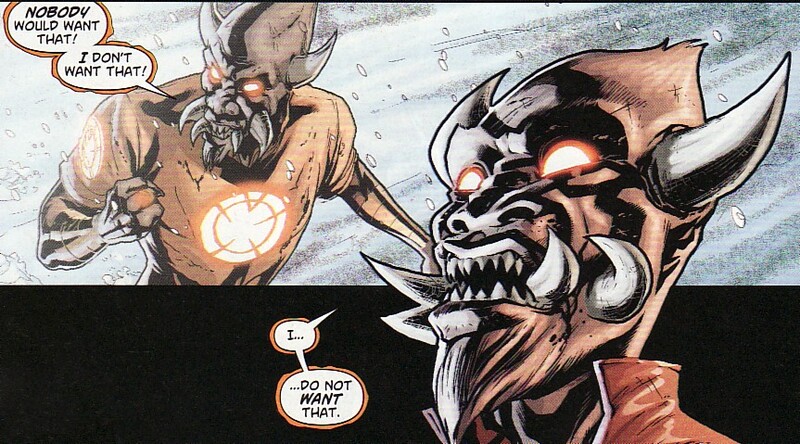 It is perhaps the first thing Larfleeze doesn't want. Nice moment. Very slick. I also hope we don't see what it is. These things are always better when left unseen, left to the reader's imagination. And finally Loisbot's master is revealed. 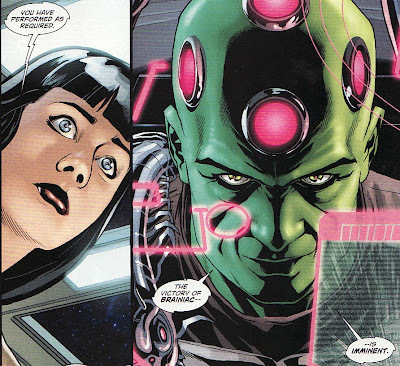 It is Brainiac who is forcing her to nudge Luthor to complete his mission. But Lois' internal monologue says that she wished she could rebel. And her expression shows how guilty she feels. Hey, I guessed that Brainiac was her master a while ago ... but even a broken clock is right twice a day. I love Luthor/Brainiac team-ups/dust-ups. So that is a great hook to carry me to the penultimate chapter. But who is the mastermind using Mr. Mind as an agent? Sivana? Darkseid? Mr. Mxyzptlk? Nothing but good stuff here, especially some of Larfleeze's moments. I usually tire very quickly with him but that final moment was magic. And we are only a couple of issues away from Superman returning to Action. The Superman arc 'Grounded' has certainly garnered its share of attention, much of it negative. Between the unconventional premise, the hype of JMS at the helm followed by his jumping ship, and a relatively unlikeable Superman walking across America, 'Grounded' seemed like a disaster for DC. When Chris Roberson was named writer on the book, I did not envy him. It seemed like big risk, little reward for him. If 'Grounded' did well, heck Roberson was using JMS' plots. If 'Grounded' failed, he would be on the deck while the ship went down. http://www.comicbookresources.com/?page=article&id=30994 As always, the entire interview is worth reading, but here are some of the blurbs that stuck out for me. Fans immediately noticed that the incoming writer's first two issues took a darker tone than Straczynski's, with Superman allowing a chemical plant to pollute a small town's environment, hints from the Superman Squad that the Man of Steel is "losing himself" and threats from evil school teacher Ms. Jennings that Superman's "descent is only beginning." "In the aftermath first of Pa Kent's death before the 'New Krypton' arc started, and then the destruction of New Krypton left him pretty messed up -- he's a pretty emotionally broken guy, because the Post-Crisis Superman is a character who never dealt with personal loss," said Roberson. Roberson continued, "In my first issue, I wanted to really make things worse before I made things better; I wanted to show that this was a Superman who had really lost his way." 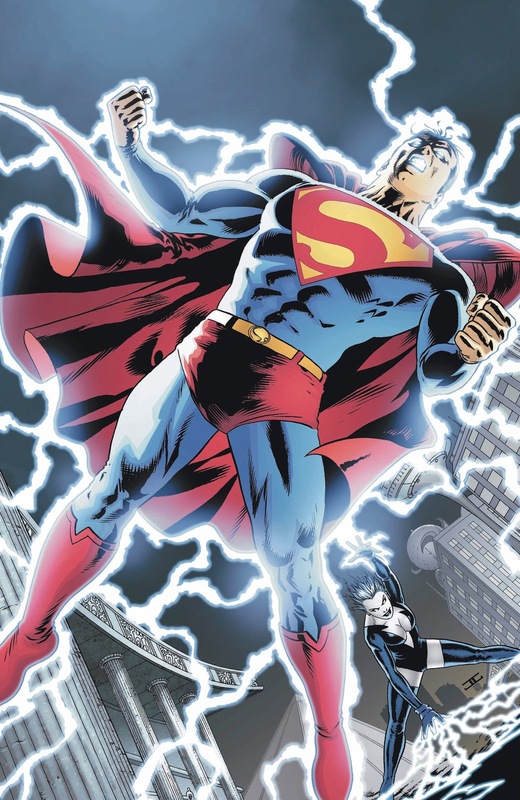 Thus the scene at the chemical plant in issue #707 where Superman not only allows workers to go on polluting the environment, he physically intimidates Lois Lane in order to prevent her from running an exposé on the plant. Sparking fierce debate among fans, Roberson told CBR News that his point is that Superman chose incorrectly. "The crux of the matter for me is that Superman is totally wrong -- not because of the merits of the environmental side versus the industrial side, but the disagreement he has with Lois is over the truth," said Roberson. 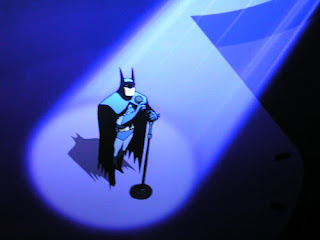 "This is a guy who stands for Truth, Justice and the American Way, and in this issue he's running away from the truth." Superman #707 really stuck out to me as being perhaps the worst portrayal of Superman in a loooong time. I did not like that issue at all, giving it a 'D' for a grade. After reading Superman #708, which rebounded a little, I wondered if the point was to break Superman down completely before building him back up. It sounds like that was Roberson's intent, which eases my mind a bit. I especially am happy that he acknowledges that the Lois/Superman exchange is the worst part of that whole thing. Certainly, Superman being damaged psychologically is an interesting idea. Certainly I have read stories of Batman walking that edge and maybe falling a bit, so I am intrigued to see where Roberson goes with this. If elements of Superman's real-world factory problems sound familiar, that is because Roberson is a fan of the Elliot S. Maggin 1972 comic "Must There Be a Superman?" a story that thematically influenced his take on the character. 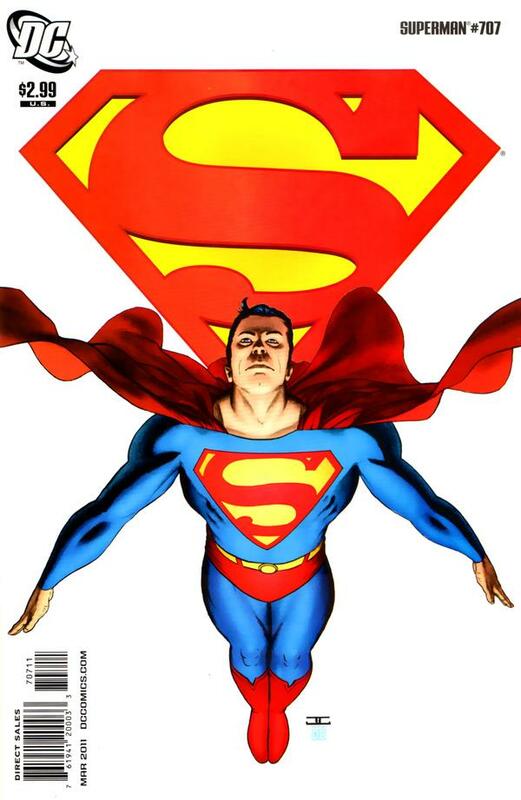 "In 'Must There Be a Superman,' Maggin's first story writing the character, Superman gets embroiled in a very down-to-earth, real world dispute between management and labor at a big industrial agricultural farm, and he comes in on the side of a whistleblower named Manuel. 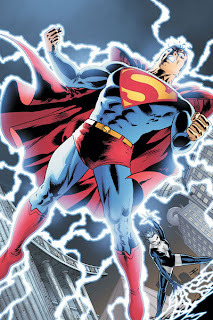 He makes his decision about what his role as Superman in human society is," said Roberson. Hence in Roberson's first story, "[Superman's] confronted by a whistleblower named Manuel in a very real world, industrial versus environmental concern, and makes a decision -- but it's the wrong one," said Roberson. I have mentione 'Must There Be A Superman?' throughout 'Grounded' as its theme is similar to what is happening in the background of 'Grounded'. I guess my question is, should I review that issue here? I would hate to keep talking about it, or having creators referencing it, if we all aren't coming from the same background. I have to admit the 'whistleblower Manuel' homage escaped me. "It'll switch back and forth between mundane issues and sort of more typical super heroics," said Roberson, divulging that natural disaster, the villain Livewire, land-usage issues and the armies of Vandal Savage will all appear in upcoming issues. "But again, the super heroic fights against big super villains will be set in the context of the kinds of issues Superman's dealing with." Roberson laughed when asked if he is staying on as Superman's full-time writer after "Grounded" concludes, admitting that though he would "give up a finger to do so," nothing has been confirmed. 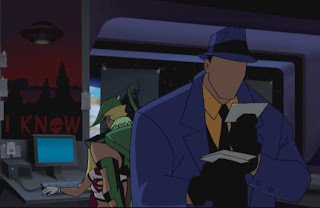 "I think it's above my pay grade, as Phil Hester says when they ask him about 'Wonder Woman.' They told me they'll find me something to do, and I have no idea what it is." With the darkest part of 'Grounded' supposedly behind us, I am glad to hear that more 'typical' Superman stories are coming back to the book. The question is how will these move the overall story arc to a satisfying close. Are we going to see a more stable Superman at the end of this? Will he go into therapy? Will the elimination of the 'outside influence' set his moral compass back to normal? All that said, Superman #708 just read different. I don't know if I am ready to give Chris Roberson the title moving forward ... at least not yet. But give me more issues like #708 and somehow wrap up 'Grounded' in a decent way and I'll give him my support. Yesterday Atomic Robo and The Deadly Art of Science #4 (of 5) came out, written by Brian Clevinger and drawn by Scott Wegener. And since it's been a while since I posted one of the commissions in my collection so figured I wouldpost this one done by Wegener back in 2008. Unlike the bulk of my collection which I obtain while at conventions, this one I actually commissioned away from a con, emailing Wegener, sending him the money, and waiting for the piece to be mailed to my home. 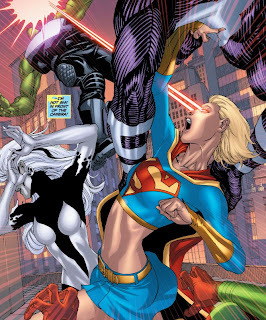 At the time, my collection was filled with lots of 'angelic' poses of Supergirl so I asked for something more action-based. First off, I love Wegener's retro-appearing giant robots. I mean, this thing could be fighting Superman in an old Fleisher Studios cartoon. Second, I love the perspective here, looking down on the robot. 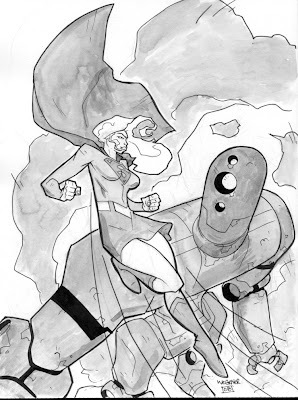 At first it looks like Supergirl is simply flying, but then you realize she is sort of perpendicular to the ground as she soars over this robot's shoulder. The ink-wash adds a lot of depth to the piece as well. Just a great commission. I have been on board with Atomic Robo since the first mini-series was released way back in late 2007. Clevinger and Wegener have been the creative team on all the minis, taking Robo on adventures throughout the 2oth and 21st centuries with a range of material from somber WWII stories to wacky adventures facing scientist dinosaurs. 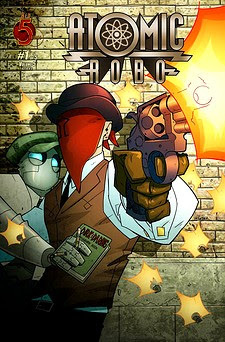 Robo is definitely worth checking out. I read yesterday afternoon that Dwayne McDuffie had passed. What a terrible loss for the comic community. I have always admired McDuffie's work. It is clear he had a passion for comics, a complete respect for the characters and their universes. And he used comics and animation as a forum for social commentary. 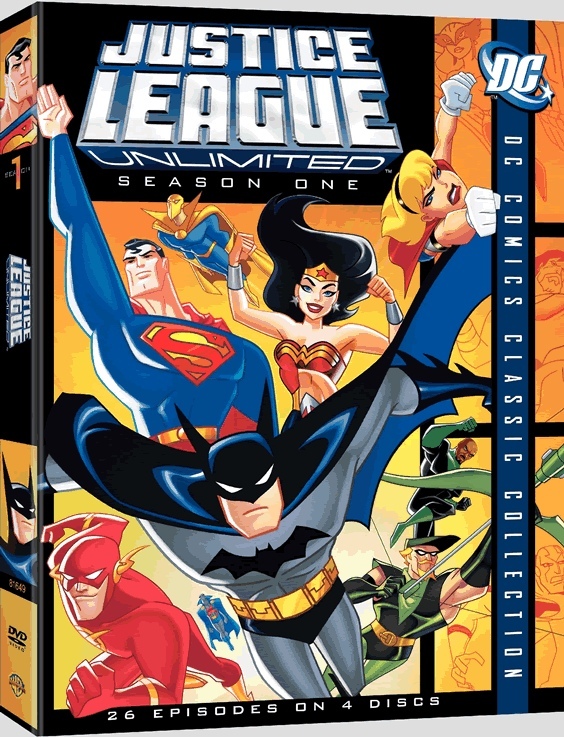 For me, one of the best examples of his work was the Justice League Unlimited animated series where he was a writer/producer for the bulk of the show. Season one really ran the gamut and showed McDuffie's range. 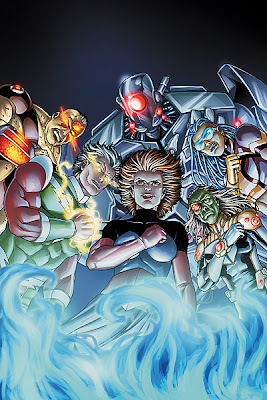 First and foremost, the Cadmus/Luthor/Brainiac storyline that runs through the show is just fantastic. It treated these characters with intelligence, creating a complex story through which three-dimensional heroes navigated. We got to meet many of the more obscure members of the DCU for the first time on the small screen. It is one thing to see the big seven. It is another to see The Question, Huntress, Stars and STRIPES, B'Wana Beast, and Hawk and Dove. And some of these minor characters end up stealing the show. I think most people will agree that The Question is one of the most memorable characters of the show. But all the characters seem well rounded, with personality quirks, making them believable and likeable. 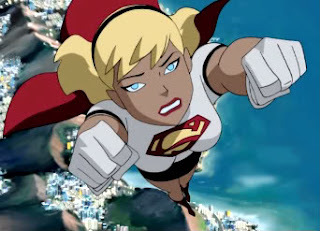 Of course, Supergirl is showcased throughout the show and really made out to be the hero. I wish I had the opportunity to have met McDuffie at some point because I would have thanked him for how he portrayed Kara on the show. But there was also a sense of whimsy in the show, an understanding that these were stories of men and women in spandex fighting. I mean, who thought they would ever see Batman singing 'Am I Blue?' and yet that moment was sublime. I especially liked the interviews I saw with him where it was apparent that he was as much a fan as he was a creator. I want my comic writers and artists to care about the characters the way I do. It was clear the McDuffie did. 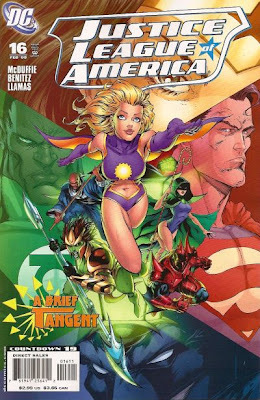 I had high hopes when McDuffie was named as the writer on the JLA comic, only to have his run sort of strangled by the ongoing 'events' happening around the title. Still, he handled the situation in a dignified manner. My condolences to his family and friends. The comic community has suffered a great loss. As always, the interview is worth reading in its entirety. I will post some of it and my usual comments. First off, that’s a pretty slick Dan Jurgens variant cover for Justice League. Glad Jurgens got to have a small part with Doomsday’s return. This is clearly a nice homage to the cover of Superman #74 way back in the original Doomsday story. Even the placement of the fallen heroes are the same. Slick. Anyways, here are the blurbs from CBR's interview. CBR News: Eddie, we spoke with Dan Didio briefly on this, but I wanted to get your take on the origins of the "Reign of Doomsday" event. Dan said the ball got rolling internally in terms of bringing the character back in a big way, but who picked up the ball from there? Eddie Berganza: It kind of evolved. We mentioned how we all really got excited by the prospect of bringing him back, and as we all settled into our new titles, I as Executive Editor was looking for ways to make the books more cohesive. It made sense to have this take place on a wider playing field. From there, everyone got excited to have Doomsday in their book. One of the key factors for me as "Justice League" editor was that James really embraced this, and it was coming in the middle of his Eclipso story line. We talked about how it always seems that the villains are very polite and take their turns, but the reality is that they'd all attack at once. [Laughter] So here we're in the middle of an Eclipso attack, and the League gets sideswiped by Doomsday, who came out of nowhere. It's similar in that when we were launching the icon covers for January and wanted to do something with Steel, which just so happened to fit within these broader plans. Well, I do agree that plugging Doomsday into an Eclipso story is going to make that one crazy issue. My worry always is will there be enough room to tell the stories that need to be told. Or will splitting the time with these different arcs mean less of a product. Both arcs deserve their time in the sun. I think Doomsday is not in the following issue of JLA but this story might be continued in the announced Superman/Batman Annual. CBR: Part of what James is going to be playing with in his issues is following up on the New Krypton stories he was writing in the Super books a while back. That's also where we last saw Doomsday, but he was more of a side character there. In "Reign of Doomsday," the villain is the primary focus, so how did you go about making the character feel different than he has in the past and feel like a bigger threat? EB: You'll see more as the issues come out, but one thing you've already seen is that he's adapting more to who he's fighting. We upped the game that way, and there will be more revelations as he goes along attacking each of the Super people. 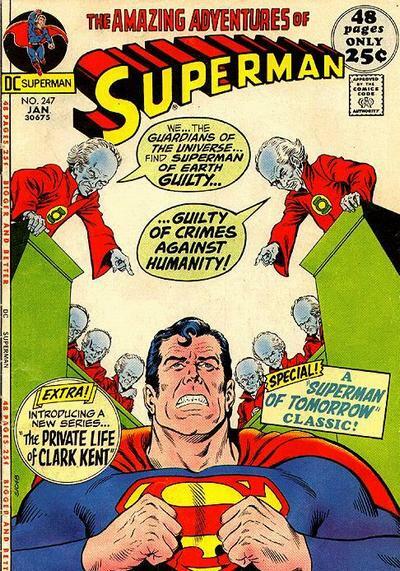 I can’t imagine why Doomsday would be going after the Superman stand-ins from “Reign of the Supermen”. Could he being used as a tool by someone else? Or is he simply working his way through the Superman Family, exacting his revenge on everyone involved in that original arc. CBR: In "Justice League" aside from two villains, the multiple battle fronts splits the team up into different group. How did you focus in on which heroes would get involved on the Doomsday side of things? EB: What's great is that we played with this as if it was real. We saw where the character were and asked where it would be the least convenient for them to be attacked by Doomsday. That's how we built this. You mention how New Krypton plays into this, and while that isn't a big part of the story, smaller touchstones from that affect how Kara plays a role. She's still mourning that event, and it draws her in. She happens to be in the wrong place when Doomsday appears. It has to do with where we last saw one of the other characters: the Cyborg Superman. 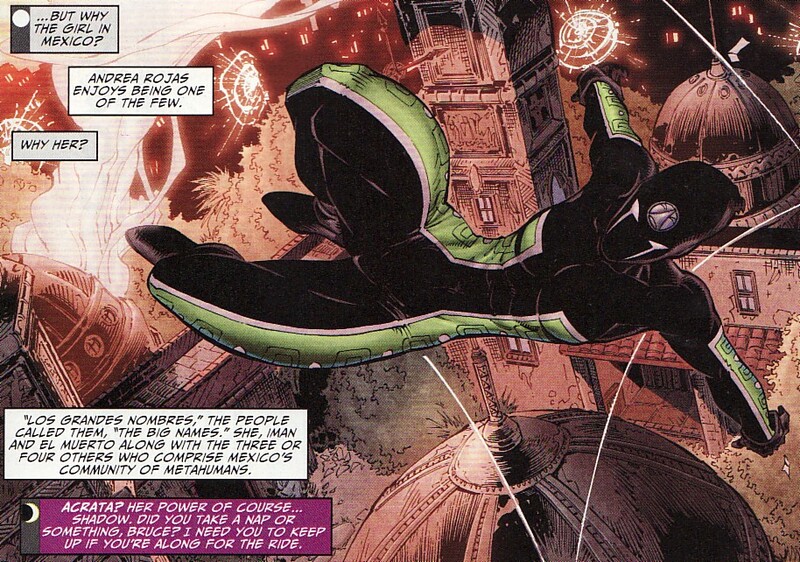 He's currently trapped inside of an Alpha Lantern who is patrolling where Kara happens to be. There's a lot of unfortunate events colliding. Well, I am glad that Kara isn’t being ignored here. She wasn’t around for the original Doomday storyline. Will Matrix even be mentioned here? Unlikely. The comments above make me think we are still in ‘Dark Supergirl’ mode here. Will she even care about Doomsday? ‘Dark’ doesn’t seem evil, just superficial, snarky, and a bit narcissistic. CBR: Cyborg Superman is a character who aside from being Doomsday's target has grown on his own into being a bigger DC Universe villain rather than just a Superman villain or a Green Lantern villain. How is James playing with that aspect of the character now that he's the victim of this piece? EB: The thing about the Cyborg Superman is that he wants to die. Ultimately, he's in the position where he's suffering the loss of his wife and the loss of everyone he ever knew. He wants to just be at peace, and he doesn't care who goes along with him. Now he's facing down the guy who killed Superman, so it's his opportunity. The question is, what can he do to make this guy mad enough to kill him? The Justice League happens to be in the middle of it all, and James is playing with an interesting idea which is that it's not always the best thing to get what you want. 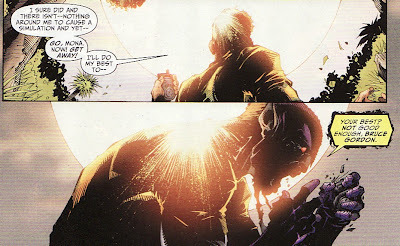 Hmmm, could Cyborg Superman be manipulating Doomsday to use as a vehicle for his own suicide? That would be pretty cool. CBR: The other key part of this story is that James has been developing the legacy heroes in the League. In the original "Reign of the Supermen" story, the stand-ins took a major role, but the wider supporting cast from Supergirl to Lois Lane to other DC heroes like Bruce Wayne all had a part to play in the bigger event. In what ways does James' story mirror that idea? I hope this isn’t played up too much here. I think we all understand that this is the JLA now. 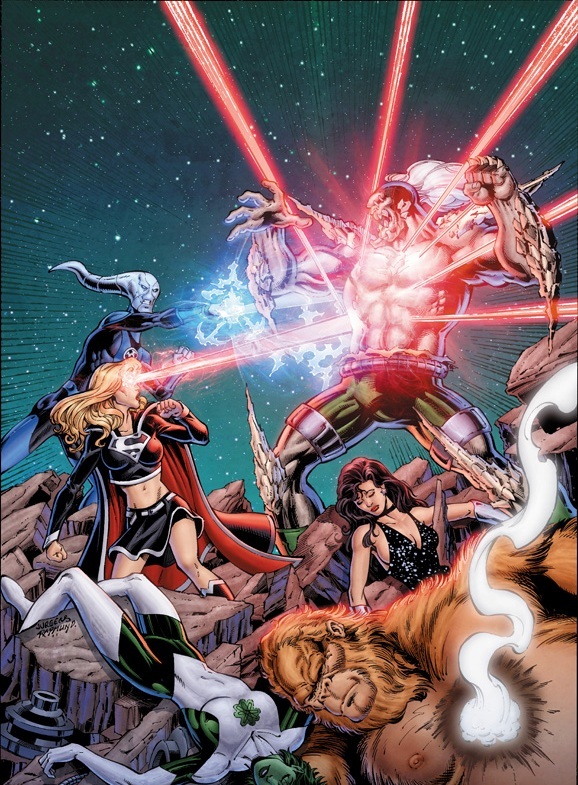 If the Starheart wasn't a big enough threat, if the Omega Man wasn't a big enough threat to convince people, I don't know if Eclipso plus Doomsday will either. Still I think Robinson is doing this team right by pitting them against the most gigantic threats. That is what the League should be like, facing massive threats like we saw throughout Morrison's run, for example. And I keep wondering if everyone is going to escape this storyline alive. I really hope that Steel doesn’t get killed as has been hinted at. Anyways, it will be interesting the see this arc weave it's way through so many titles. Poll: What New Title Should I Formally Review Here? With the announcement that R.E.B.E.L.S. is going to end in May, I realized that there would be a hole in my monthly blog routine for a non-Super comic to review. R.E.B.E.L.S. was a guilty pleasure and while it didn't really fit into the theme of this place, I liked stretching my legs a bit into the rest of the DCU. When the end of R.E.B.E.L.S. was announced, I posed the question of which book I should start reviewing here on a monthly basis and got some interesting suggestions, all of which were already on my pull list. But I thought it would be fun to run a quick poll to see which title should be added to Comic Box Commentary's monthly review. So here are the suggestions with some of my thoughts. I hope people will be interested enough to vote. 1) Batgirl - I was so taken in by Batgirl #8 and Batgirl #14 (both bought because of Supergirl appearances) that I quickly went out and scooped up all the back issues I could find and added the book to my subscription. It is a sneaky good book ... always loads of fun. Steph is a very likable character and she is working hard to be part of the Bat-family while being herself as well. The one thing is I know nothing ... I mean nothing ... about her time as Robin, Spoiler, the events around her 'death', etc. So I won't have the historical background I do with Supergirl. Still, I love the book. 2) Birds of Prey - Another fun book, albeit in a very different vein than Batgirl. Gail Simone has such a handle with these characters and writes them as three-dimensional fully formed people. 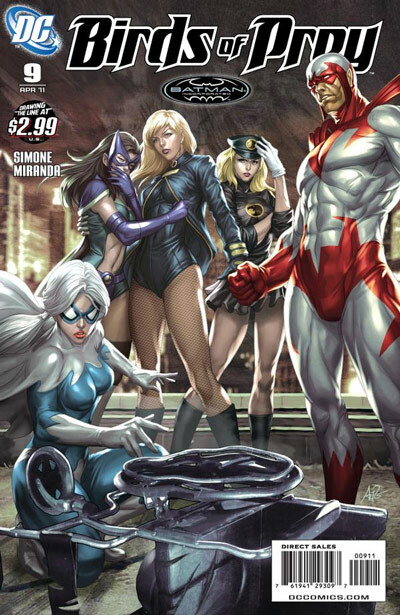 I have always been a Huntress fan, but I became a Black Canary and Oracle fan because of Simone. I also like Hawk and Dove a lot (I would love a H&D solo series) and Lady Blackhawk is a hoot month in month out. I collected Simone's original run of BoP and this new title, but little else of the book. I think I have a pretty good handle on these characters. It is a bit of a darker book than I am used to reviewing which might mix things up nicely. 3) Legion of Super-Heroes - Well, I have been reading Legion books for almost as long as I have been reading. Some of my earliest memories of comics are the Grell issues of Legion (I suppose that dates me somewhat). They are one of my favorite concepts in comics, although some reboots have been rougher than others. I know I am in the minority that liked the '5 years later' run. I didn't get any of the DnA books. 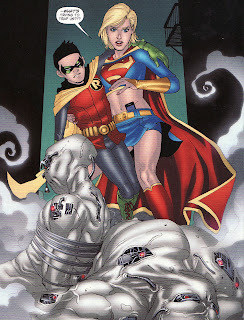 I liked the Waid/Kitson books and not just because Supergirl was in it. So I have enough background with the book (especially here with Levitz picking up where he left off those many years ago), that I would feel fine reviewing the book. I have talked about featuring Legion here in the past but never got around to doing it. Is now the right time? 4) Zatanna - You can't beat the current creative team of Dini and Igle. The issues I have read of the title have been solid. 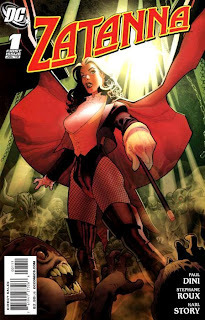 It would be a fresh book for me to review as I have a working knowledge of Zatanna but nothing in depth. 5) Sterling Gates' Top Secret project - When will it be announced? What will it be? One thing I do know, Gates has won me as a fan so I will be buying the title. But should it be reviewed here? 6) Other - Of course, these were the only suggestions I got. Maybe there is something I'm not even thinking about.If you vote other, let me know which title you are thinking of. Anyways, I thought it might be fun to open the floor for a vote. Vote early ... vote often! 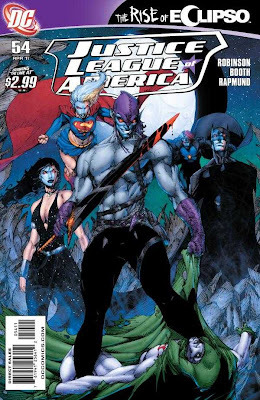 Justice League of America #54 was the opening chapter of the Rise of Eclipso story arc and as such, doesn't read much like a JLA comic at all. That's not to say it isn't a good book. But outside of a couple of splash pages and one panel late in the story, the League isn't seen at all. This book is part primer on Eclipso, reviewing his origins and incarnations, and part whirlwind tour of the DCU as Eclipso forms his Shadow Warriors. As someone who knows mostly the 'older' Eclipso stuff, has no knowledge of 'The Darkness Within' event, and barely knows about Jean Loring's manifestation, I thought this issue sort of brought me up to speed. I usually think of Eclipso as a sort of 'yard stick' character, a powerful being who always gets beaten up so another character can then be measured as being 'tough enough to beat up Eclipso'. He has never really been written in a way that makes me think he is worth all the fuss. As a side conversation, I hate when good characters devolve into yard-stick characters. Poor Prometheus went from almost beating the JLA single handedly to having Huntress beat him in combat (okay we later learned it wasn't *the* Prometheus). Poor Lady Shiva who is touted as the deadliest martial artist in the DCU ... but I can't remember the last time I saw her win a bout. The worst 'yard stick' character is the Spectre, the 'most powerful being in the DCU' who has been defeated recently by Atrocitus. I can't remember the last time the Spectre showed up and just destroyed someone. And sadly it looks like the Spectre is going to get defeated in this arc as well. Okay ... enough of a rant. The thing is, I would rather that this had been a one-shot Eclipso book rather than fall under the JLA title. I mean, the Starman/Congorilla one-shot is more deserving of the JLA moniker than this book. Maybe I am splitting hairs. I mean, the purpose of comics is to entertain and this issue, for the most part, did. So here is the splash page showing the current roster of the JLA. 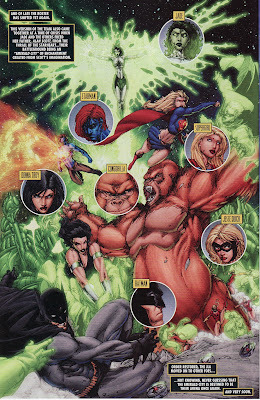 But it comes after a page showing the big seven and other incarnations of the League. I just think we have come far enough with this team that we don't need to be hit over the head anymore. They are the League. I wholeheartedly accept it. Heck, I like this lineup. So I don't need to hear anyone else in this book say 'This is the Justice League'. But once we have that introduction out of the way, we are immersed in the Eclipso story. Bruce Gordon once again houses the demon inside him and is back on Diablo Island to try to investigate Eclipso's origins, again in hopes of controlling the evil within. What is strange is that Eclipso manifests himself in the bright noonday sun. Usually he needs an eclipse of some sort to break into this plane. While this transformation isn't explained, it does provide a bit of a mystery and therefore a hook, or potential way to defeat the villain. I hope that this is explained at some point. 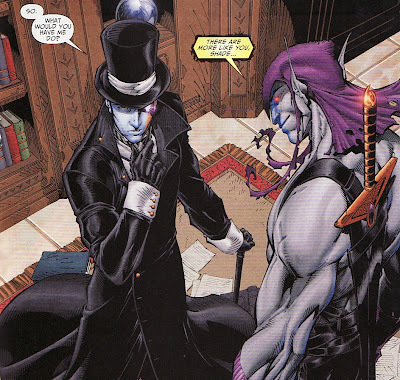 Once back on this plane, Eclipso begins an internal dialogue with Gordon, allowing Robinson to review the variety of ways Eclipso has appeared on Earth. I love the one panel explaining Jean Loring's stint as Eclipso. She was simply 'too Jean' to be Eclipso. I thought that was perfect. Poor Jean Loring. I never thought she was a good fit to be Eclipso so I was glad to see that go away. And then we get a little bit more Eclipso history, showing him playing chess with Darkseid, and this shot right from the 'Darkness Within' event where a possessed Superman fought Captain Marvel. One thing I did like was Eclipso's grudging respect for Gordon, how this simple solar scientist has done more to deny Eclipso his desires than any of the more powerful figures in the DCU. 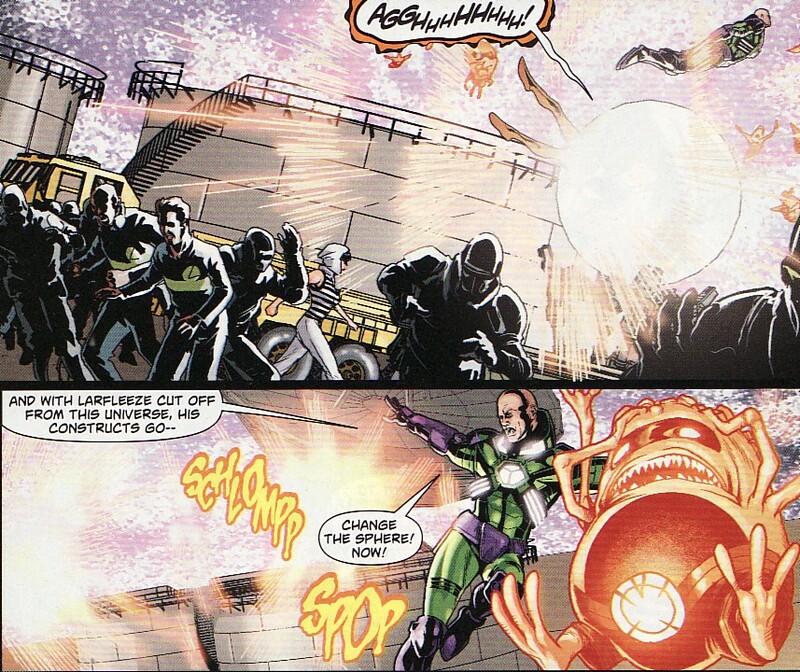 But reviewing these failed attempts at conquest makes Eclipso see the error in his tactics. No longer will he try to possess metans to do his dirty work. He has a bigger idea. So with the past reviewed and my knowledge of him at an all-time high, Eclipso begins traveling through the DCU and possessing select people to form his army. The first of his agents is the Shade. Next is Nightshade. He possesses the Shadow Thief. In fact he gathers everyone with shadow-based powers. That includes some characters I have never heard from. One of these is Acrata, a young hero from Mexico. The Bete Noire from France. All meta-humans with shadow powers. I don't recall reading about any of these characters before so I don't know if Robinson is being extremely creative in making these characters, or extremely thorough in his dredging of the DCU. Either is possible. Maybe it's both? 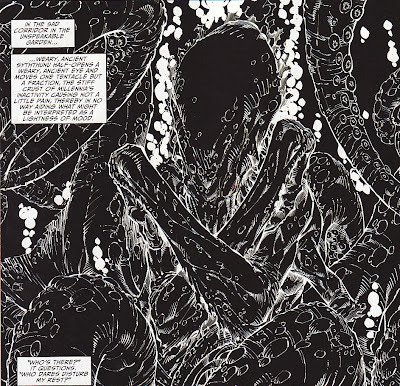 My favorite 'new' character that joins Eclipso's army is Syththunu, a very Lovecraftian elder one, feared even by Arion. Now I am going to have to dig out my old Arion comics to see if he uses the name Syththunu in any incantations. That would be slick. So why all these shadow based characters? My guess is to plunge the Earth into some sort of shadow realm which will augment Eclipso's powers. But who knows. 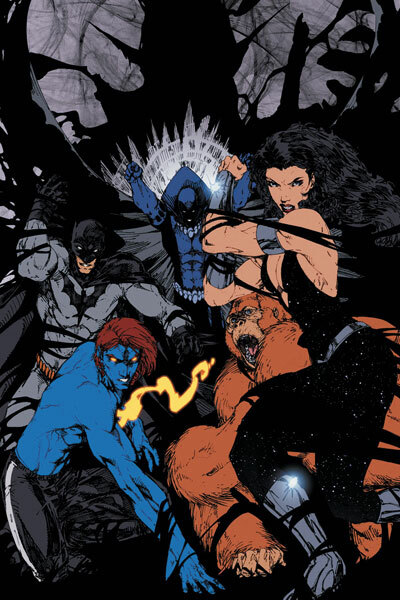 But Eclipso has one more person he needs to gather to his flock. Someone 'tainted by darkness' ... Jade! Throughout Robinson's run we have seen Jade wielding black tinged energy, losing control at times, nearly killing villains. 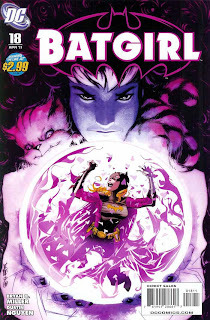 I am not surprised that she might be someone who could be corrupted by Eclipso. In fact, I think it is a great twist to the story ... and that makes me happy. 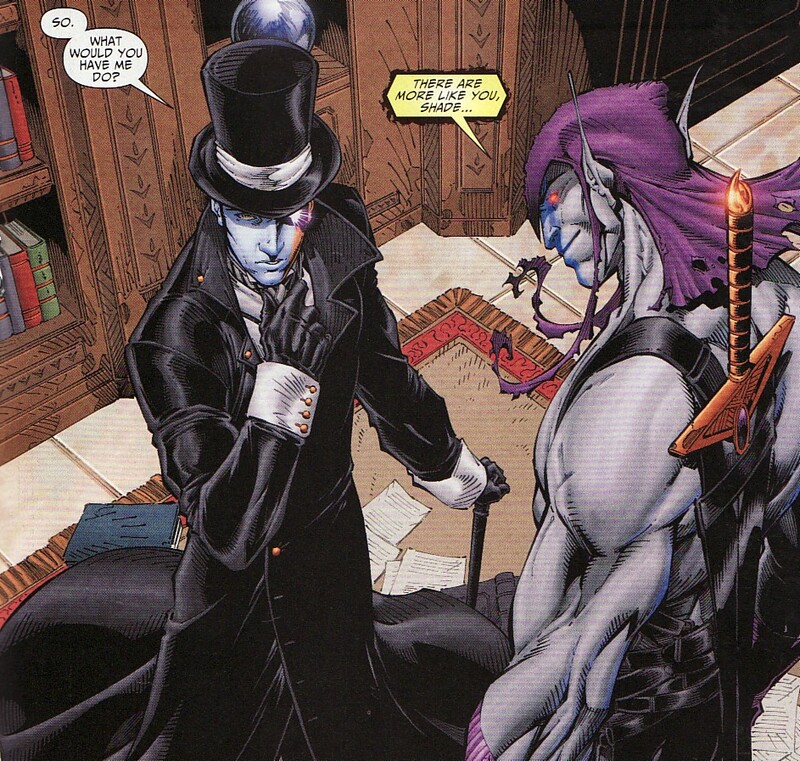 So Eclipso is almost ready to launch whatever plot he is going to launch. And yet next issue we know will include Doomsday. Should be a wild issue. Perhaps the best thing about this issue was the addition of Brett Booth to the book as artist. His stuff leaps of the page, detailed, stylish, lush. I cannot wait to see his work on this book ... especially given the 'bigger than life' stories that Robinson has been bringing us here. So, while it's not really a JLA issue, this did set up the next big arc nicely and filled in some knowledge gaps about Eclipso. Add to that these newer characters and Booth's spectacular art and I would say this was a success. 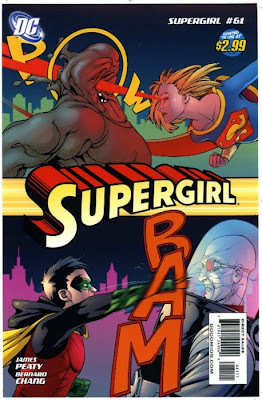 Supergirl #61 came out this week, the second issue with the new direction for the title and the first issue with James Peaty as the sole writer. Nick Spencer is gone after (I suppose) one half of one issue. Last issue seemed to calm some of the concerns many had with the title and the loss of Sterling Gates as writer. Supergirl #60, while a bit talky, set the table for this arc, laying out the pieces and the overall plot. It wasn't a perfect issue but it was pretty good. Would this issue pick up on the momentum of the first issue? Would the lack of Nick Spencer hurt or help the story? 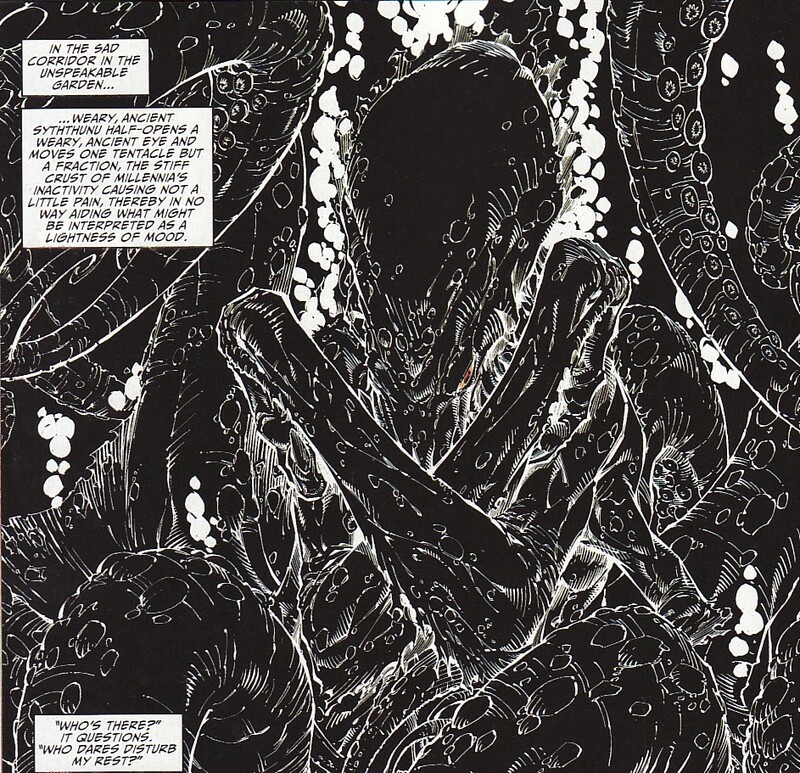 For me, most importantly, the thing I want to see is the characterization from the Gates' run pulled forward. I don't want to see a regression in Kara's characterization, how she acts, or what she's like. So far ... so good ... sort of. Last issue, 4 heavyweight Superman villains teleported in and attacked Supergirl, seemingly overwhelming her. And they should defeat her. 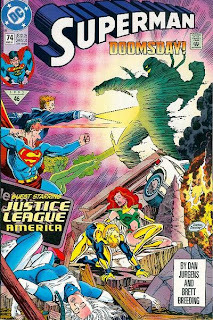 I mean, Silver Banshee, the Kryptonite Man, Metallo, and the Parasite can all give Superman a run for his money in a one-on-one battle. So the four of them should defeat any Kryptonian. That's why I was somewhat surprised initially to see Supergirl take all four of them out so easily. It is a very lovely splash page by Bernard Chang. And it definitely made me raise an eyebrow about the villains and if they are truly who they appear to be. One thing I did like about these first pages is the opening line of the book: 'My name is Kara Zor-El and this is my life.' Of course these were the opening and closing lines of Sterling Gates' run so I thought it was a nice little technique to make this feel familiar. 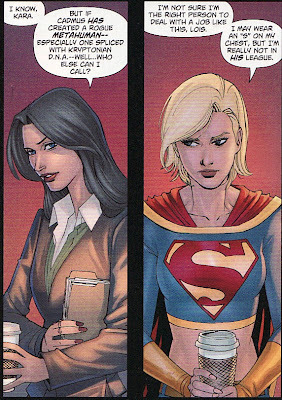 It also gives us some insight into Supergirl's inner thoughts. 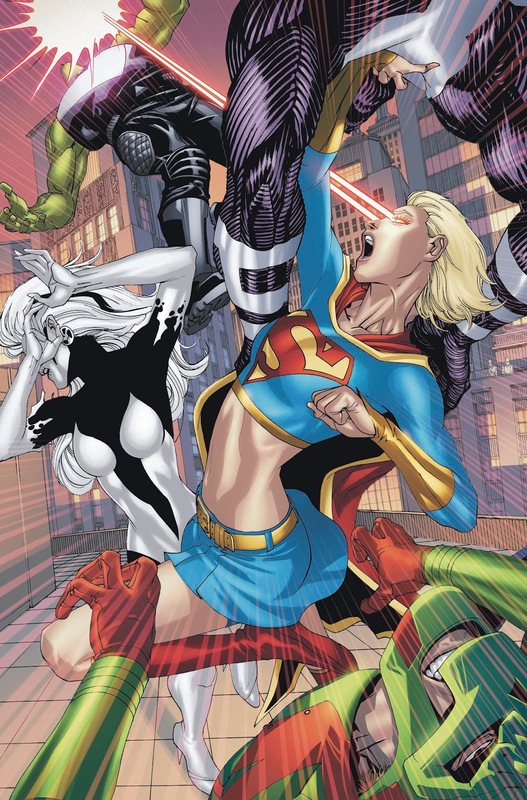 Alex, the villain of the piece and presumed Cadmus super-clone, is impressed with Supergirl's abilities to defeat these villains. And with this initial test run of his Flyover app a success, he decides to leave the hallowed halls of Harvard and move on. To make sure he is able to walk away without leaving a trail, he seems to mindwipe the students he was chummy with last issue. So the guess someone made last month that maybe some Maxwell Lord is in Alex' genetic mix seems much more plausible. But this is where I have to question last issue a bit. Apparently we aren't going to see these kids anymore. So why devote so much time to them last month. In fact, why the heck would Alex even be in Harvard anyways? Why would he befriend these people? I wonder if this is the first shakedown of Nick Spencer not being on the book anymore. It seemed that the presence of these college kids served two purposes. One, it provided an easy path to exposition, explaining the Flyover app and Alex' thoughts. Two, it showed that Nick Spencer can write snappy young dialogue. The first might be valid. But the second just wastes page space if it doesn't impact the story. Still, even if we are not seeing them again, it doesn't explain what Alex was doing there in the first place. Of course, the mind-wiped students are befuddled. And her lips, which recently kissed Alex, taste like chalk. Hmmm ... sounds like he might be an unstable clone, going the way of the Bizarro. Meanwhile, the villains that Supergirl defeated disappear as quickly as they arrived, teleported away. 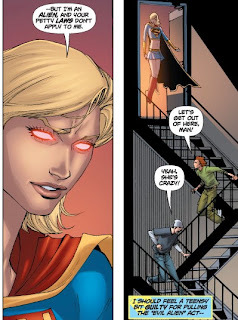 In what I thought was a nice piece of characterization, I liked how Supergirl dealt with the two teenage boys who got her up on that roof to begin with. When they continue to pester her for her phone number, and refuse to clear the scene, she gets all 'Dark Supergirl' on them playfully, showing off the glowing eyes of an 'evil alien'. It seemed playful and confident. It felt right, even in the post-New Krypton world where people still might not trust Kryptonians. Supergirl needed to roof cleared because she knew that Lois was arriving via helicopter to talk to her. 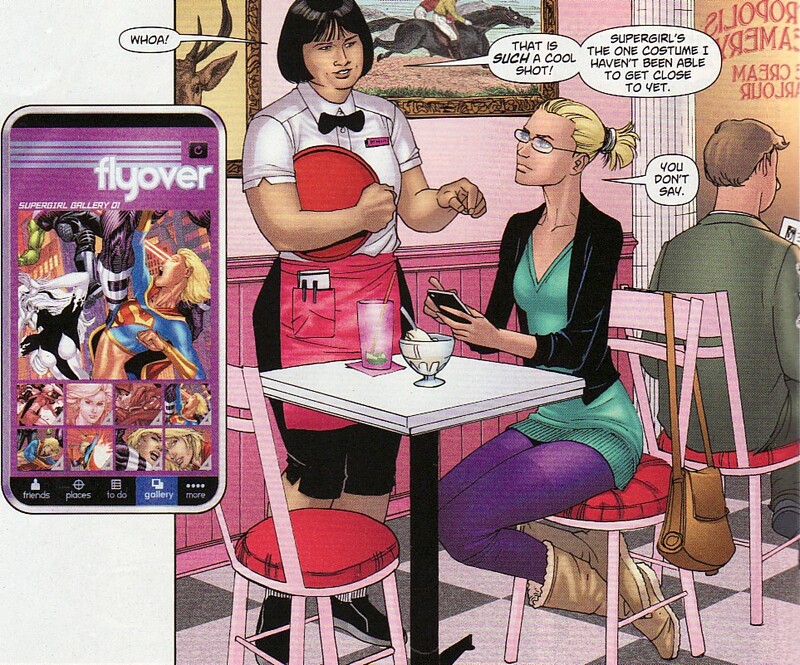 I like how Lois brings her a coffee! Lois lets Supergirl in on the news of Cadmus' super-clone plans, asking Kara to help out since Superman is still walking all over. In a bit of characterization that felt a little off, Supergirl says she might not be the right person for the job, saying she isn't in Superman's league. While I am happy that Lois stops that train of thought by saying that others should judge Supergirl. 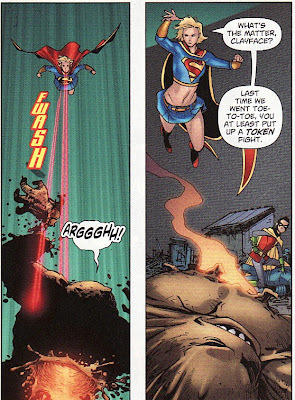 Still, even if Supergirl doesn't think she is as good as Superman, I think she would say 'I'll help out any way I can.' I don't need Kara to be awash in self-doubt again. This felt like a little step backwards. That said, this is the book that Lois fans should be reading. She is being portrayed spot on in Supergirl. 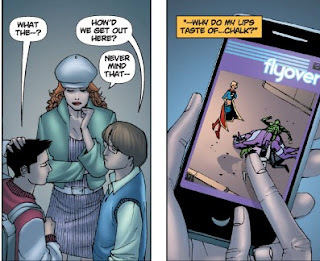 Lois tells Supergirl that she found Kara by using the Flyover app. I thought that showed just how prevalent this thing has become already. But Supergirl not knowing what a smartphone is? I mean, she is a teenager and a member of the Science Guild. While the 'so like her cousin' was a cute comment, this felt a bit off too. The app seems everywhere as Linda Lang is browsing it while enjoying a bowl of ice cream. Even the waitress notices and says that she is also on Flyover, trying to snap some pics of heroes. I can't say how happy I was to see Linda again. I really hope that Linda Lang (and Lana for that matter) remain a big part of this book. But I also wondered if this scene might be a subtle insight on another part of this arc. Linda eating ice cream alone? Maybe part of this arc is to have her connect (or re-connect) with the younger heroes in the DCU, to create friendships with these heroes so that she isn't eating sweets by herself. Or am I over-thinking this? While in the ice cream shop, the Flyover app shows Damien in Gotham City ... and then suddenly Damien being flanked by Clayface and Mr. Freeze. It's a nice little parlay between Damien and Supergirl initially, with him asking her why she is there and maybe she should make herself useful. Together they take out the villains quickly, Supergirl even wondering why Clayface didn't put up more a fight like he did the last time they faced off. Is that from Superman/Batman #19 or Superman/Batman #62? I can't think of another encounter. I did like how Supergirl is able to figure out pretty quickly that the Flyover app is probably behind these recent attacks. She has seen too much of this app too soon. Even if Damien doesn't buy it, Supergirl is sure. Sure enough to know that Blue Beetle is in danger in El Paso. 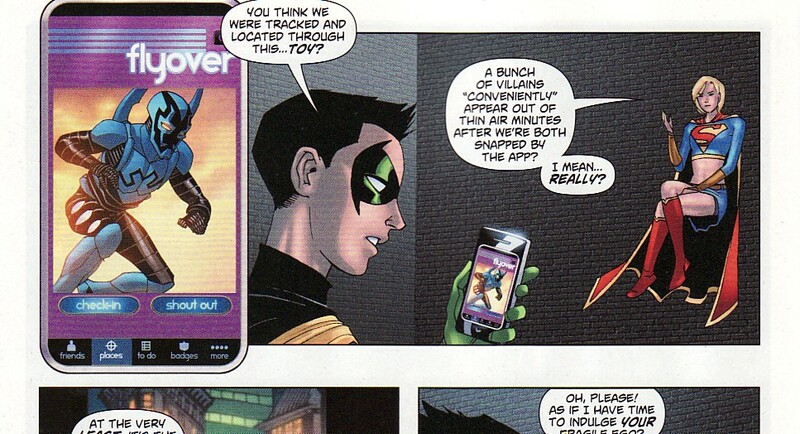 I don't think it's a stretch for Supergirl to realize that this app is like a GPS for attacks. And then we see just how the villains are being defeated so (relatively) easily. They aren't the villains but some sort of android mimicking the powers of the villains. 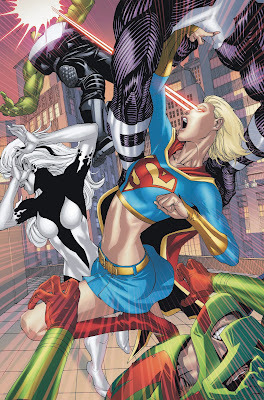 That explains why Supergirl was able to defeat the big guns in the beginning of the issue. Throughout the issue we see Alex in his secret lab, scheming, and realizing that Supergirl is the biggest threat of them all, and might be worthy of special attention. So overall, I thought this was a pretty good issue. I think that there were a lot of ups in this book, with a couple of missteps. Still, I think the characterization of Supergirl here was more right than wrong. I think James Peaty is doing his best to pick up right where Sterling Gates left Kara. Yes, the 'I'm not Superman' comment didn't seem right and stood out as being off. And I'll say it again, I am glad that the college student angle seems to have been removed. Issues are shorter these days as a way to keep the price $2.99. That means I will have little tolerance for wasted space. And the dialogue and back story of those guys last issue now seems meaningless. Bernard Chang continues to do stellar stuff here. I am glad he has remembered the new short haircut Kara is sporting. And his action sequences have always been top notch. Will this book remain Peaty's after this arc? When will DC let us know? Or is the 'fear of cancellation' still in the air such that DC isn't going to name anyone long term. I'd love to hear Peaty come out and talk about the character. There were the usual surprises when I perused the solicits. May seems like a month that DC is using to clear the decks a bit. Here are some of the solicits with my usual comments. It’s the brutal conclusion of “Good-Looking Corpse”! The true identity of the villainous Alex has been revealed, and he’s taken over the minds of Miss Martian, Robin and Blue Beetle. His first order? 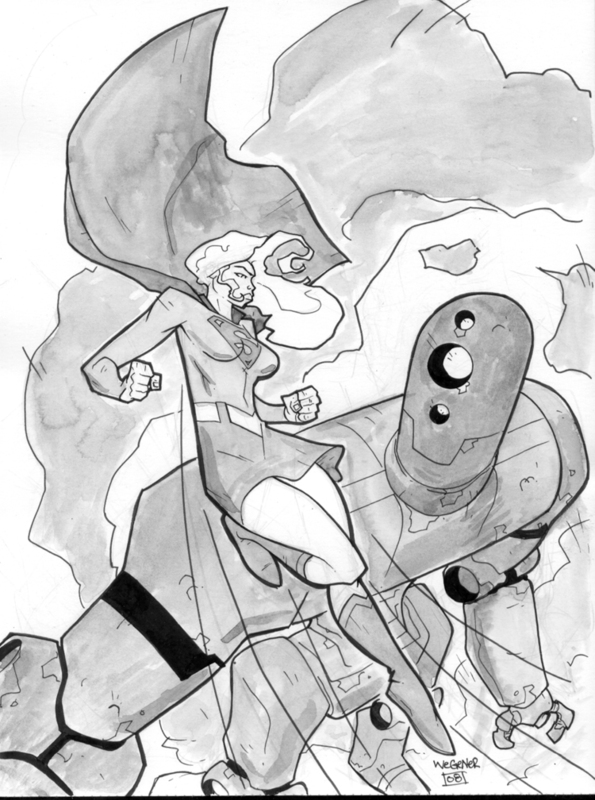 Destroy Supergirl by any means necessary! Interesting that this whole arc will be over in just 4 issues. I don't recall if we heard how long the initial Nick Spencer story was going to be. The solicited 'cover' is a splash page from Supergirl #61 so we'll have to wait a bit to see what Amy Reeder has in mind. I think I am going to be very happy with Brett Booth's art in this book. Looks slick. No mention of Supergirl, Dark or otherwise, here. I hope the Spectre actually is tough in this book. He always seems to be getting the snot kicked out of him. Is he the toughest being in the DCU or not? 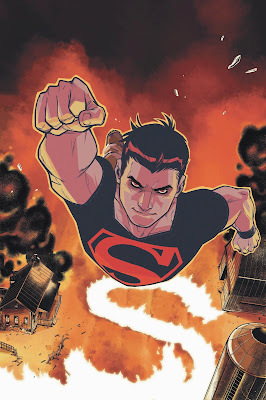 Well, Superman #708 was a step in the right direction for 'Grounded'. I really hope the arc builds on that energy. That said, this solicit is the 12th issue to be labeled as a part of 'Grounded' and frankly I am hoping it will wrap up soon. That said, I like Livewire, one of those rare cartoons to comics characters like Harley Quinn. And it is nice to see Jimmy listed here. I hope the supporting cast starts showing up more. We can’t tell you much about this issue without ruining some of ACTION COMICS #900’s surprises, but suffice it to say, Doomsday’s back – and you’ve never seen him like this before! Doomsday’s first appearance brought about the “Reign of the Supermen,” where four characters – Superboy, Steel, Cyborg Superman, and Eradicator – came onto the scene to try to fill Superman’s shoes. Now, with “Reign of Doomsday,” it looks like Superman might need to fill their shoes! 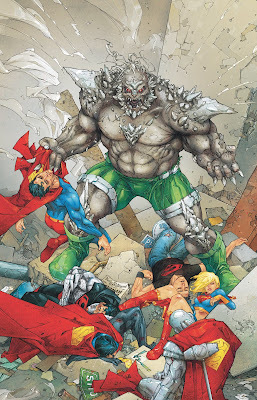 Well now we know where the Kenneth Rocafort picture of Doomsday is going to be seen. What a great cover. And he is doing the interior art too! Now that is fantastic news! He is one of those artists whose work I like so much I might pick up the book just for his art. Now it looks like Superman and all the 'Reign of Supermen' characters and Supergirl are down and out here. So who is left to face Doomsday? 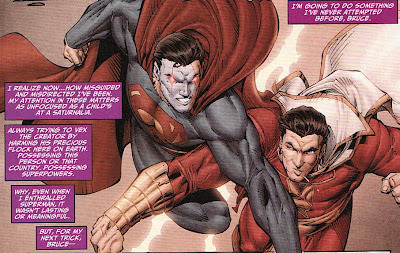 I have heard speculation that it's Kal-L. Or maybe Superboy Prime. Or maybe even Power Girl. But there has to be something compelling Doomsday to do this, right? 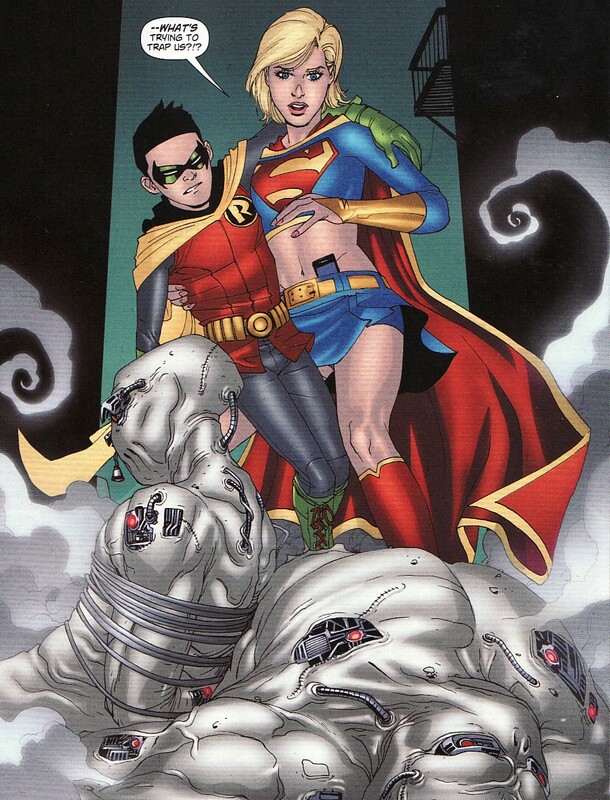 I had hoped that the 'evil side' part of Superboy's character wouldn't be touched upon for a long time in this book. After Geoff John's set up story in Adventure and the first few issues here, I had hoped the 'I'm half-Luthor, when will that manifest' type of plot wouldn't be necessary. It is clear that Conner is a hero. Anyways, maybe this is all some dream sequence by the evil Quakers in the book. Marco Rudy is now listed on art and I don't know if I am happy about that. His art seems too rough for this book. And Karl Kerschl is now on covers. I loved Kerschl's work on the Wednesday Comics Flash. I hope he stays on the book for a while. 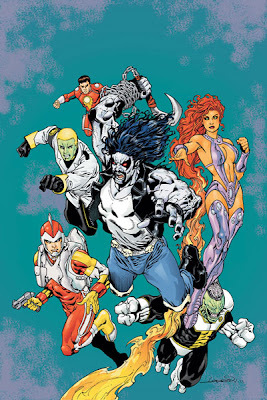 With Starro the Conqueror on the verge of complete victory, our rebel fighters Lobo, Vril Dox, Adam Strange, Starfire and the gang pull out all the stops in this series’ bloody conclusion! That's right. This is the final issue of R.E.B.E.L.S. I suppose that DC gave the book every chance in the world to succeed. And to be honest, this didn't really shock me. The book itself felt like it was struggling to find it's way these last few months. But what did surprise me is that this was one of five books DC is cancelling in May. Five! The others are JSA Allstars, Outsiders, Freedom Fighters, and Doom Patrol. I guess all of these have been on life support for a while. I really liked this incarnation of the Doom Patrol. And I can't get enough Freddy Williams' art in All-Stars. That guy rocks. I collect 3 of the 5 books! Suddenly my pull list is lighter. It feels downright funereal. My guess is with the Flashpoint books coming out and whatever new titles are being born from Brightest Day that DC needed to clean house a bit. So now that I won't have R.E.B.E.L.S. to talk about here, what non-Super title should I start to review?